For the 22 addresses on the east-west Madison, Monroe, & Tyler streets, 11 houses listed here were moved. The sequence letters along left edge of the entries correspond to the magenta tag numbers (for Madison, Monroe, & Tyler original locations) visible in the "Distribution of relocated houses..." Google Earth views on page Expansion: Moved Houses. The El Paso Co. Assessor file photo (b/w) of each house at original address is on the left side. Unless otherwise noted, the color snapshots of houses at current locations are my own - Jim R. Jones. The "Last Assessor record" is the latest year noted on the original address assessment record before it was archived as inactive. The "Building permit, move out" is the year the move permit was issued for the house at its original address. The "Building permit, move in" is the year the move permit was issued for the house at its relocated address. Original Address: 112 E Madison St. Original Address: 114 E Madison St. Original Address: 118 E Madison St. Original Address: 124 E Madison St. Original Address: 111 E Monroe St. Original Address: 115 E Monroe St.
Seen in 1940 aerial photo on page Moved Houses Research. This house was relocated in 1975 as part of the Colorado Springs Urban Renewal Effort (CURE) for Lower Shooks Run. 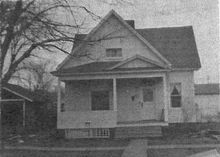 This house and the one at 714 E Moreno Ave. (entry "K" on this page) were donated by Penrose Hospital to CURE, as shown in a Gazette Telegraph article "CURE GETS HOUSES" (photo), Gazette Telegraph, 21 Sep 1975, p 10-A. See Note K-2 for article link. An article "Shooks Run Project Gets $250,000 From State; Largest Grant Given" in the Gazette Telegraph, 25 Sep, 1975, p 9-A, describes the funding to the CURE project for Shooks Run, and the donation of the two houses by Penrose Hospital to CURE. See Note K-3 for article link. Original Address: 119 E Monroe St. Original Address: 100 Tyler Pl. Seen in 1956 aerial photo on page Moved Houses Research. 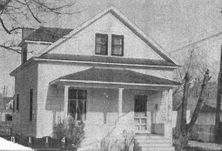 This house was featured in Gazette Telegraph front page article & photo "House makes tracks across Springs", Aug. 28, 1991. See Note H for article link. Although the Gazette article says that the house "...was moved to 417 West Mesa Road" - the house was actually placed with its front pointing west on the corner lot at N. Walnut and W Mesa Rd., and so has the address 835 N. Walnut St. The article also notes that Penrose-St. Francis Healthcare System had donated the house to the Pikes Peak Habitat for Humanity. Original Address: 119 Tyler Pl. 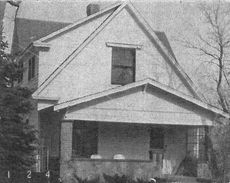 Eric Swab recalls the move of this house, funded by a Community Development Block Grant (CDBG), and its original use by the City. See URBAN RENEWAL RESEARCH under Research Summary on page Moved Houses Research. Owned by Colorado Springs city. Original Address: 123 Tyler Pl. Original Address: 115 Tyler Pl. This house was relocated in 1975 as part of the Colorado Springs Urban Renewal Effort (CURE) for Lower Shooks Run. A photo and article "MOTOR HOME?" of this house being moved to its current location appeared in the Gazette Telegraph, 7 Oct 1975, p 6-B. See Note K-1 for article link. 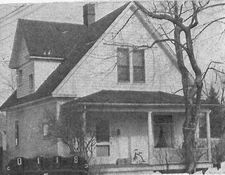 This house and the one at 524 S Prospect St. (Entry "F" on this page) were donated by Penrose Hospital to CURE, as shown in a Gazette Telegraph article "CURE GETS HOUSES" (photo), Gazette Telegraph, 21 Sep 1975, p 10-A. See Note K-2 for article link. This house was identified as moved from the Penrose Expansion area by Eric Swab, who was the CURE project coordinator for Shooks Run. See URBAN RENEWAL RESEARCH under Research Summary on page Moved Houses Research for more information. General: A valid Pikes Peak Library District card and PIN is required to log-on through the links to Gazette articles below. Note H: Gazette Telegraph , Aug. 28, 1991, page 1A, by Mark Reis, Gazette "House makes tracks across Springs"
Note K-1: Gazette Telegraph, 7 Oct 1975, p 6-B, Gazette Telegraph Photo by Gary Gillen "MOTOR HOME?" Note K-2: Gazette Telegraph, 21 Sep 1975, p 10-A, "CURE GETS HOUSES"
Note K-3: Gazette Telegraph, 25 Sep, 1975, p 9-A, "Shooks Run Project Gets $250,000 From State; Largest Grant Given"